I hope that you find it beneficial! As with all of my photologues, I consider it "live" and I may make additions or changes with time so feel free to check back. Thanks for sharing this great pictures. I enjoyed your pix when you first posted this message, but now I want to show my spouse, and the link is broken within the shipcafe site. Can you fix it? 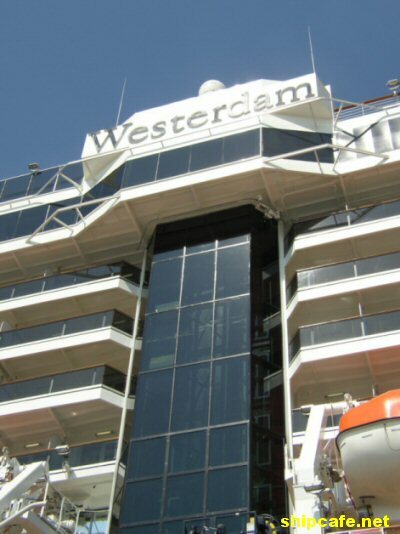 Or post the url for the westerdam pix here. There's nothing "clickable" for the Westerdam on your site as of the time of my post, Steve. I said elsewhere, and so I'll repeat it here ... an excellent job, as always! Thanks for the photos of the Westerdam! I'm not going to be able to pass up trying out this ship. She looks way to classy to miss. Thank you, Steve and Gitte. Yes, the link is indeed clickable now. Beautiful pics, Steve. Gitte, I'll look forward to your review and photos when you return from your not-too-distant North Cape cruise! Sorry about that downfall in site maintenance ! . . It should, indeed, be up and running and I hope that you find it useful.